Celebrating day seven of the 12 days of Boba Fett covers! It would be hard for me to pick a favorite cover out of all the covers that were published by Marvel for Star Wars #1. But, one cover clearly stands out to me as my least favorite. The Mile High Comics exclusive cover for Star Wars #1 is the first in a series of 6 interlocking covers drawn by Humberto Ramos. Humberto Ramos is best known for his work on DC Comic's Impulse title and Marvel Comic's Spider-Man character. His work is stylized and easily recognizable. His art is influenced by Manga and therefore is cartoonish with exaggerated features. He does not just borrow from Manga however, his characters are dynamic, not unlike a Jack Kirby drawing. He is able to use the Manga style to express emotions in characters that otherwise would be difficult. For example, Peter Parker's expressions are apparent, even through his Spider-Man mask. Ramos' art is polarizing for many comic readers; it seems people either hate his style or love it. I tend to be mixed; I like some of his work and do not like others. 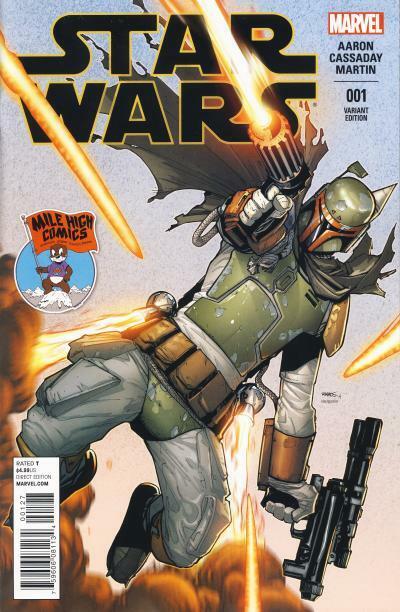 Unfortunately, Ramos' art on the Star Wars #1 Mile High Comics exclusive cover is one of his pieces that I do not like. Boba Fett is flying, presumably by using his jet pack, although it looks like the jets are attached to his belt. Worse than the jets are the proportions used on Boba Fett. Fett's body is too long and slender, looking more like Peter Parker's torso than our favorite bounty hunter's. Additionally, Fett's head is too small. The character is wearing armor and a helmet, so the exaggeration should have been to bulk Fett up more, not make him skinnier. It is unfortunate that I do not like this cover, as his other covers for issue #2 - 6 are more appealing with his cover on the Mile High Comics exclusive for Star Wars #4 being my favorite. 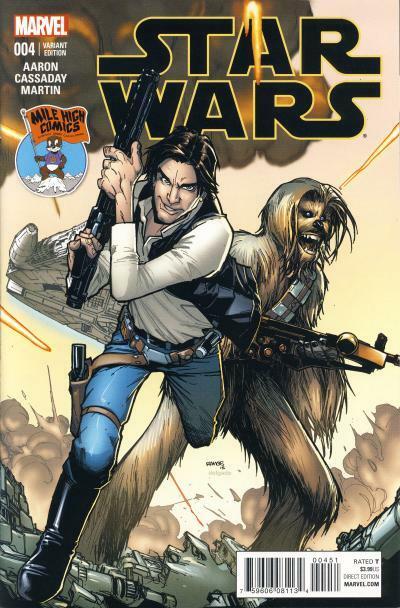 On this cover, Ramos' unique style is apparent and both Han Solo and Chewbacca are drawn in a dynamic, cartoonish way, but none of the proportions are distracting. Celebrating day six of the 12 days of Boba Fett covers! 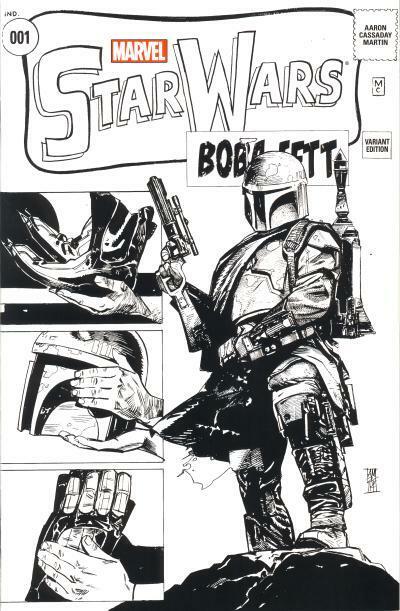 The popularity of Boba Fett with Star Wars fans meant this relatively minor character from the movies would received considerable attention from Dark Horse Comics and Del Rey. In the Expanded Universe, Boba Fett was even given a wife and a daughter, as well as a brother of sorts. 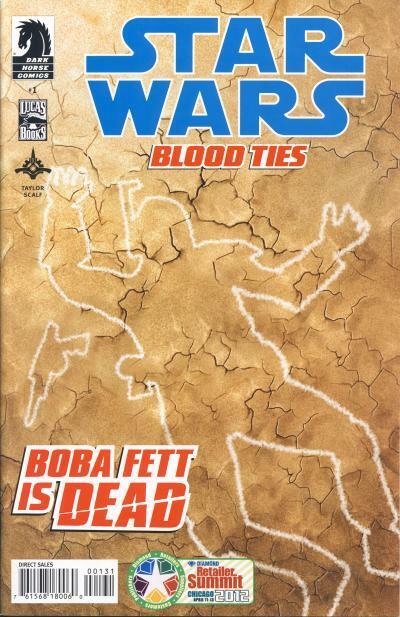 These relationships were explored in the second Star Wars: Blood Ties mini-series titled Star Wars: Blood Ties - Boba Fett is Dead. 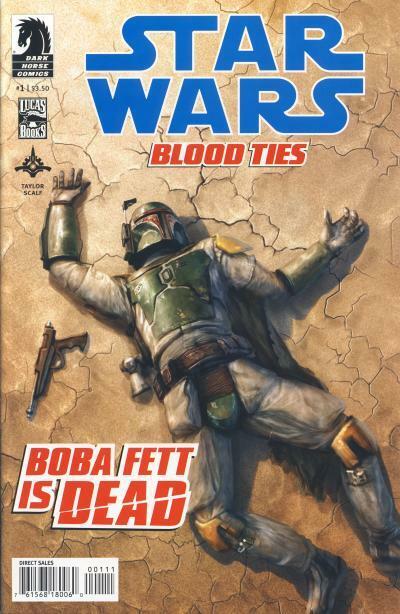 The standard cover for Star Wars: Blood Ties - Boba Fett is Dead #1 by Chris Scalf shows Boba Fett lying on dry and cracked ground with his blaster by his side, dead. This cover, along with the title of the comic, immediately grabs the reader's attention. The alternative cover by David Palumbo is striking because of the use of red in the background. 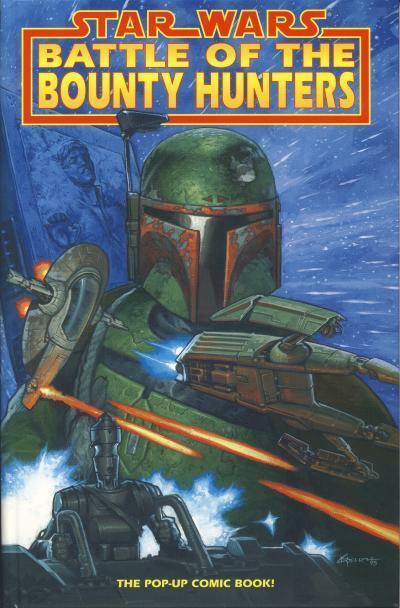 Boba Fett is in cross hairs and one can believe this is the situation right before the scene on the main cover takes place. A copy of this comic given to attendees of the 2012 Diamond Retailer Summit in Chicago, Illinois from April 11 - 13 has another cover. This variant cover is a clever take on the standard cover, with Boba Fett's body and blaster removed and replaced with a chalk outline. Celebrating day five of the 12 days of Boba Fett covers! 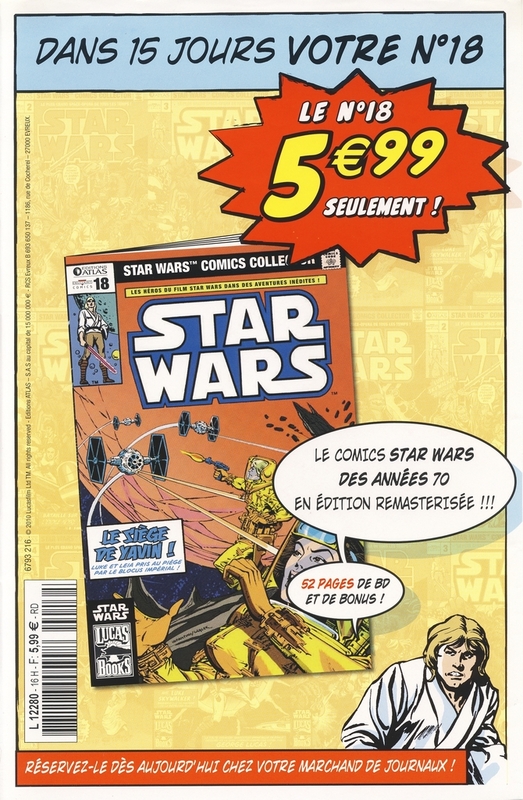 The Star Wars Comics Collector title was published by the French publisher Editions Delcourt under the imprint Editions Atlas. 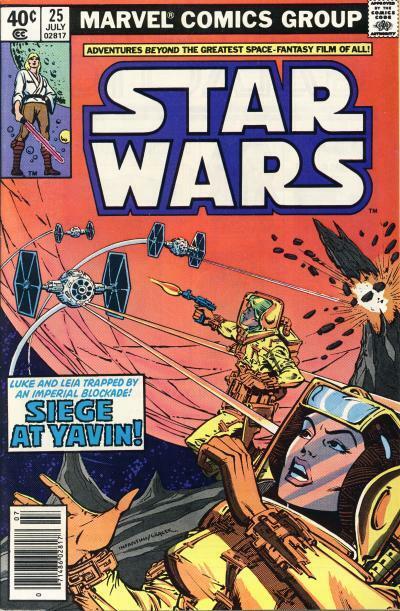 Issue #17 contains Star Wars: The Early Adventures #8 and part of #9. Star Wars: The Early Adventures #9 reprints the story The Frozen World of Ota. This newspaper strip was originally published from June 17, 1980 through August 10, 1980. 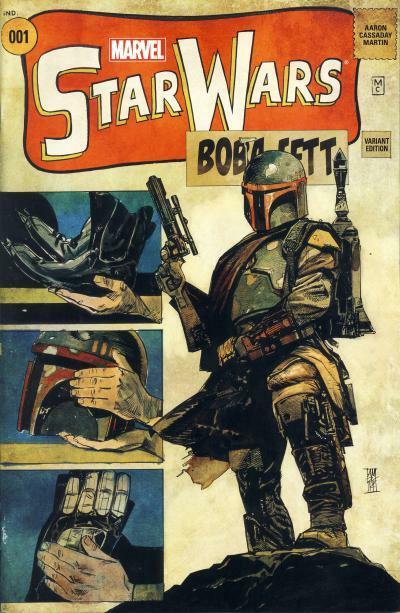 Boba Fett's first appearance in the story was in the daily strip published on June 19, 1980, almost a month after The Empire Strikes Back was released to movie theaters. At one time, it was believe his appearance in the newspaper strip was his first comic appearance, but we now know several Marvel publications containing the movie adaptation proceed this story. 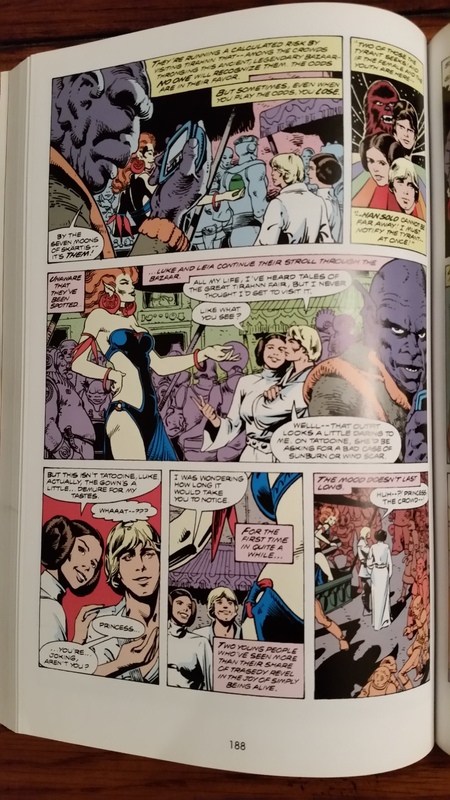 His appearance in the strip does proceed his appearance in Marvel's Star Wars #42, which is probably the reason for the confusion. 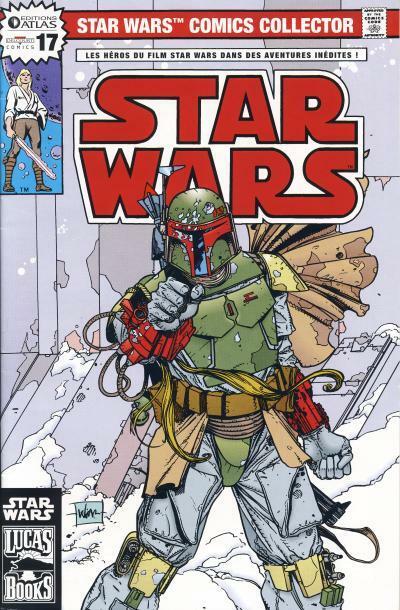 Regardless, this is Boba Fett's first original comic story. 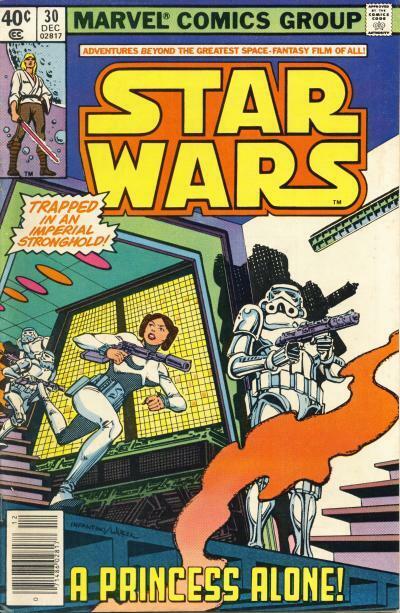 The cover to Star Wars Comics Collector #17 is the same cover used for Star Wars: The Early Adventures #9. 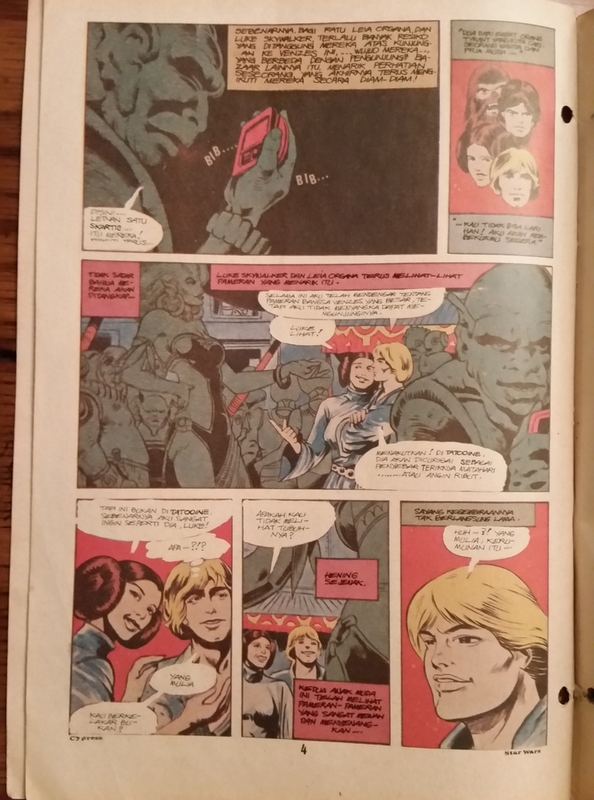 With the comic is a 1 sheet ad for issue #18 in this series. You Rebels! You are interfering with orders from Lord Vader himself! Han Solo: Scared to death, kid! Clearly Boba Fett is not the notorious bounty hunter that he will become. Celebrating day four of the 12 days of Boba Fett covers! 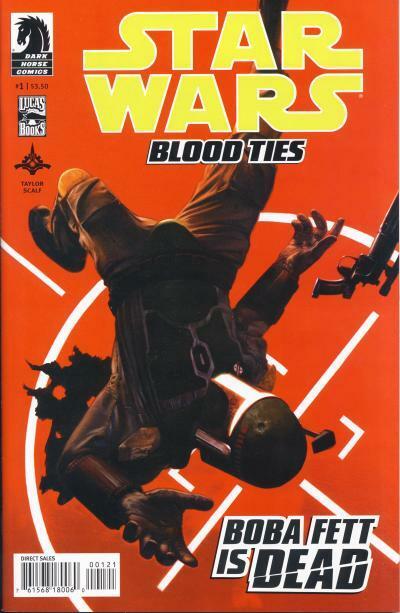 Dark Horse Comics published a unique Star Wars comic in July 1996, a pop-up comic book! This hardcover comic is only 12 pages and has a very simple story. Boba Fett is taking the carbonite encased Han Solo to Jabba the Hutt. Flying Slave I, he is attacked by IG-88 in the IG-2000 and Fett destroys the IG-2000. Then on the surface of Tatooine, he encounters a Stormtrooper patrol and blasts them. Just outside of Jabba's Palace, he is attacked by a Krayt Dragon and kills it. Finally, he delivers Han Solo to Jabba and asks for a bonus for his efforts. 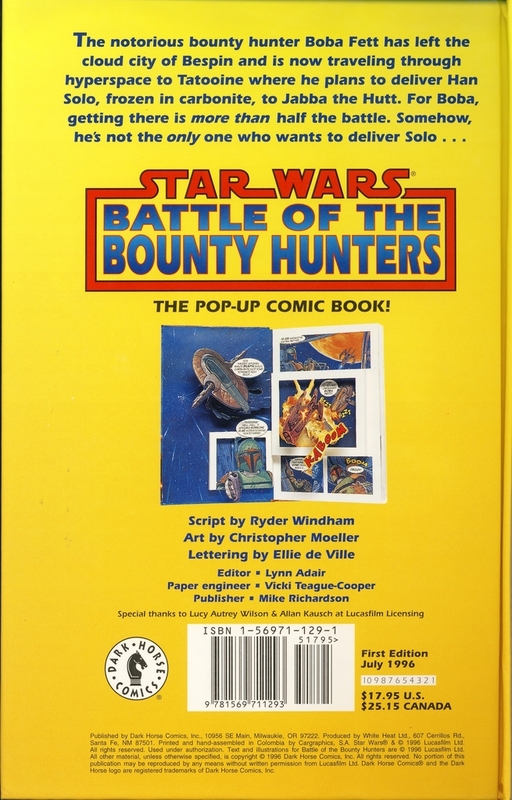 Despite never mentioning it, Star Wars: Battle of the Bounty Hunters is a tie-in to the multimedia event, Shadows of the Empire. The Kenner Shadows of the Empire Special comic that came in the Boba Fett versus IG-88 action figure 2-pack also features Boba Fett, but in that comic, Fett is forced to land on Gall by IG-88 where he runs into Bossk and Zuckuss. The events in this pop-up comic take place after the story in that comic. This hardcover book was clearly over-published by Dark Horse back in 1996. In fact, when the license reverted to Marvel in January 2015, more of these books were released to discount book stores almost 10 years after it was originally published. The copy I am showing here was purchased at a Half Price Books store as a Christmas gift. The store had ample copies for sale. Celebrating day three of the 12 days of Boba Fett covers! 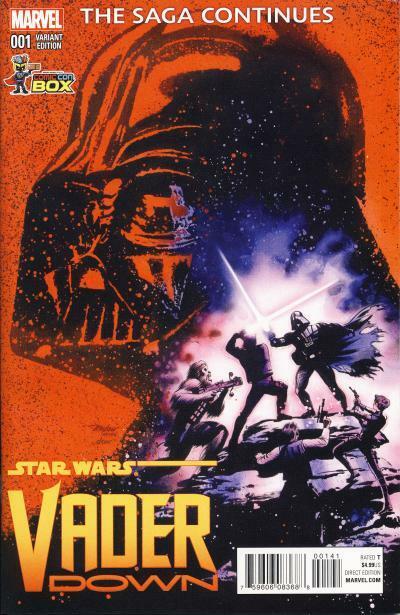 An Alex Ross painting of Darth Vader flanked by Stormtroopers is used for the 1 of 50 incentive cover for Stars Wars: Darth Vader #1. A black & white version of that cover is used for the 1 of 200 incentive cover. It is his cover for the Alex Ross Store exclusive that features our favorite bounty hunter. For many Star Wars fans, their first exposure to Boba Fett was in the Star Wars Holiday Special which aired on CBS on November 17, 1978. Much of the special plays like a variety show that was a staple of television programming in the 1970s. 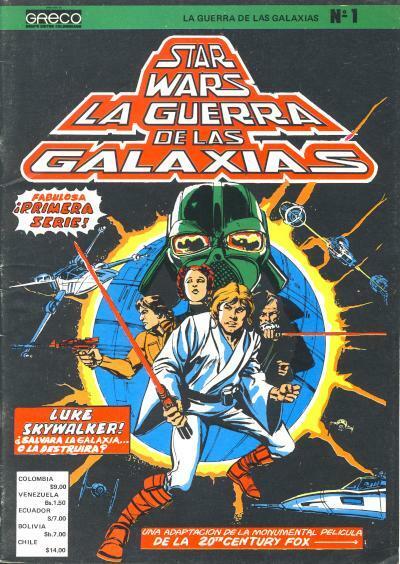 One of the variety show segments is a 9 minute cartoon that tells the story of Luke Skywalker rescuing Han Solo and Chewbacca and is the inspiration for the Alex Ross Store exclusive cover. Han and Chewbacca are sent on a mission to get a talisman for the Rebellion, but a video signal from the Millennium Falcon shows there is a problem. Luke, C-3PO, and R2-D2 use a Y-Wing Fighter to follow the Falcon which crashes onto a liquid covered planet. The Y-Wing Fighter also crashes into the thick goo and the fighter is attacked by a dinosaur-like creature. Boba Fett arrives riding another of these dinosaur-like creature and saves Luke. Boba Fett tells Luke he knows where the Falcon is and leads him to the ship. During the trip there, C-3PO tells Luke his misgivings about trusting Fett. When they find the Falcon, Luke, Fett, C-3PO, and R2-D2 board only for Luke to succumb to a sleeping virus caused by the talisman. Han is also infected. Fett and Chewbacca, astride Fett's mount, travel to the nearest Imperial controlled city to retrieve an antidote. At the city, we learn that Boba Fett is working for Darth Vader, who refers to Fett "as the best bounty hunter in the galaxy." Their plan is for Fett to gain our heroes trust so they will take him to the hidden Rebel base. C-3PO and R2-D2 intercept the transmission between Fett and Vader and after Fett uses the serum to revive Luke and Han, C-3PO informs the others of Fett's plans. Fett, using his jet pack, takes off but not before he threatens to meet our heroes again. 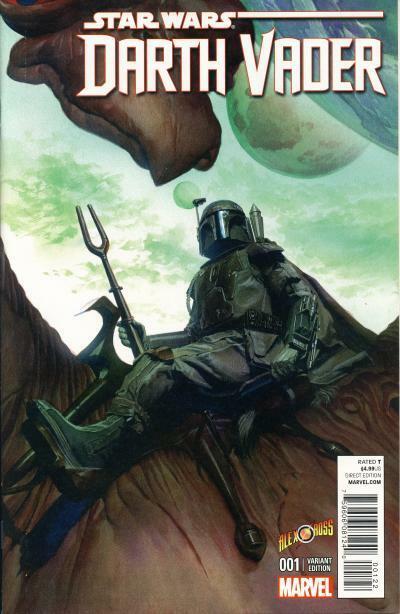 The cover by Alex Ross shows Boba Fett astride the dinosaur-like creature. He is holding a staff that he uses to control the beast. The painted cover is how Fett would have looked to Luke when he is rescued. Celebrating day two of the 12 days of Boba Fett covers! The Heroes & Fantasies comic shop exclusive Star Wars #1 has a cover drawn by Daniel Acuna. Heroes & Fantasies also has a black & white version of their exclusive cover. This cover is another homage, this time to Amazing Spider-Man #129, the first appearance of the Punisher. 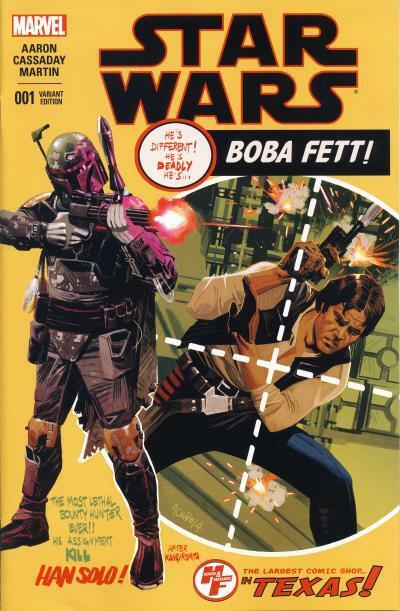 This is the first day of the 12 days of Boba Fett covers! For the next 12 days, I will be showing the covers for 12 comics that feature the most notorious bounty hunter in the galaxy. 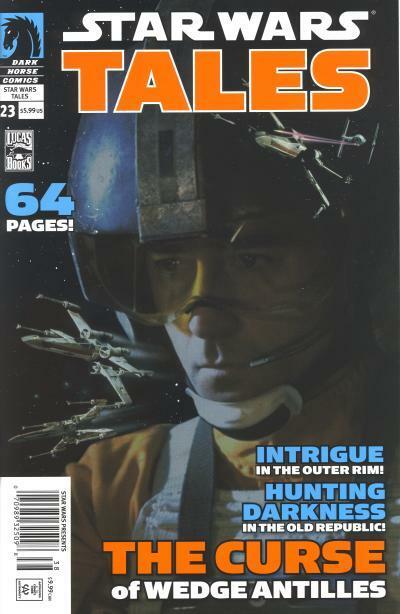 Alex Maleev provided the cover for the Warp 9 comic shop exclusive. Like many shops, Warp 9 also offered a black & white version of their exclusive cover. This cover is one of the more notable variant covers for Star Wars #1 due to it being a homage to Tales of Suspense #39, the first appearance of Iron Man. In addition to the layout and actions of the character on the cover, the logo and color choices closely match those found on the cover to Tales of Suspense #39. Subscription boxes for a variety of products have been around for several years now. 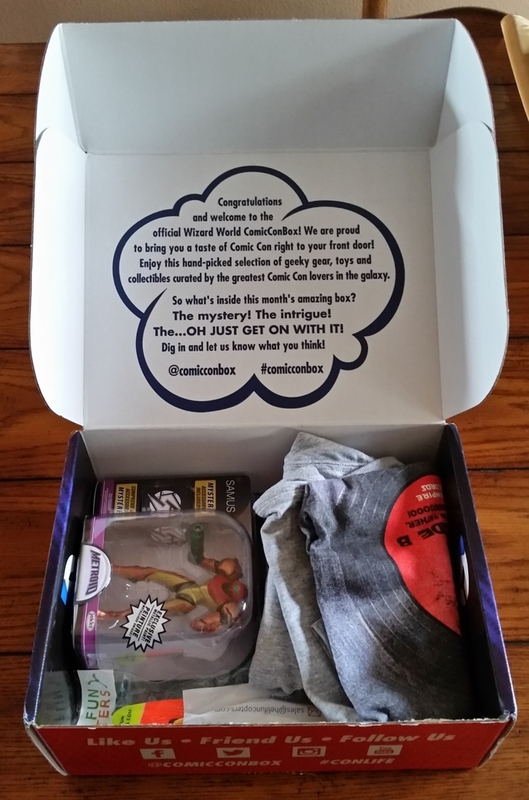 The idea behind a subscription box is a customer subscribes to the service, and once a month the company sends a box full of product to the customer. Usually, the customer does not know what they are getting and the company claims the value of the items in the box are higher than is being paid. These have become so popular, even big retail stores like Walmart are planning on offering their own box service. It has become commonplace for customers to post a video on YouTube as they dig into these boxes for the first time. In recent years, there has been a steady rise in subscription boxes that offer pop culture memorabilia. Some even offer comics including: Comic Bento, Comic Block, Loot Crate, ZBOX, and Comic Con Box. And some of these comics are exclusive to the service. The first Star Wars comic exclusive from one of these subscription box services was the Star Wars #1 Loot Crate exclusive. It is believe the Loot Crate variant for Star Wars #1 accounts for 1/4 of that comics approximately 1 million copies. When Star Wars: Vader Down #1 was published in November 2015, it was natural for exclusives to accompany the release. There were a few more subscription box service exclusives than were published for Star Wars #1. 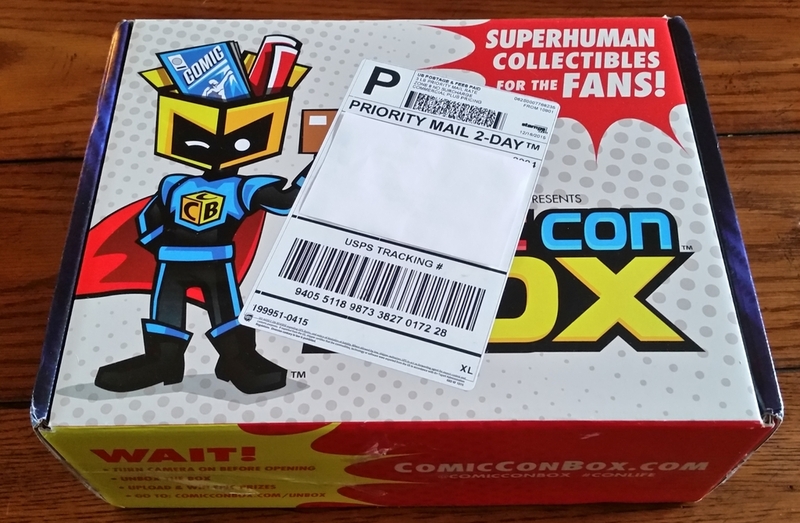 Three of the subscription box exclusives came from Comic Con Box with two of them in their Box 8 offering and one made available with a 3 month subscription. 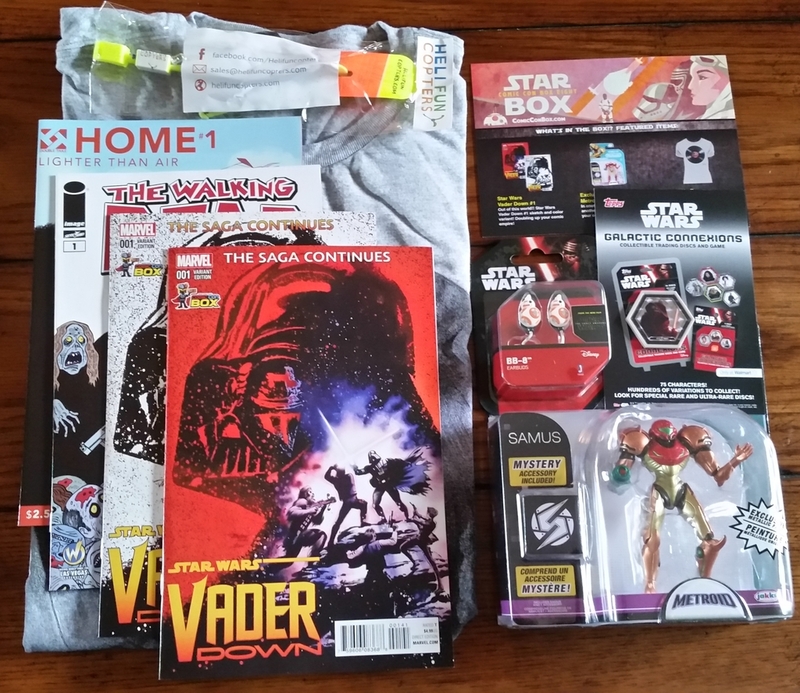 I had purchased the Loot Crate box for the Star Wars #1 exclusive and outside of a Transformers T-shirt I still wear, I cannot remember what else came in the box. To be honest, I am not interested in most of the items they send with these boxes; I want just the Star Wars comics. The Comic Con Box was slightly better. Not only did I receive the two Star Wars comics, but it also has a Star Wars T-shirt and the Walking Dead #1 Wizard World Las Vegas exclusive. There is another comic called Home: Lighter Than Air #1 by Double Take, but a quick glance shows me I am not interested in that particular comic. As for the rest of the items in the box, I already gave them away to my kids. Return of the Jedi was originally titled Revenge of the Jedi, but the name change came after several early promotional pieces were released, including the poster this cover is based on. 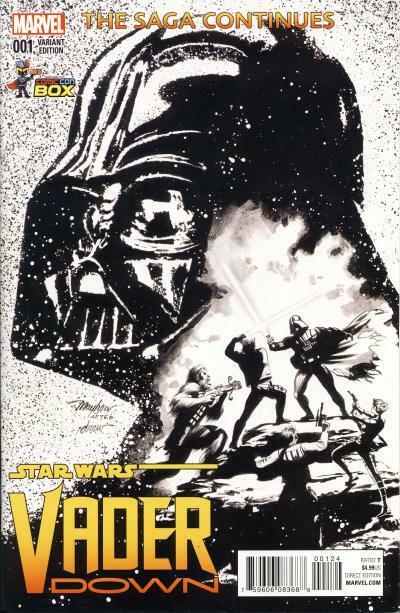 Like the original poster, this homage still has Darth Vader and Luke Skywalker engaged in a lightsaber duel, but on the comic cover they are joined by Han Solo, Princess Leia, and Chewbacca. 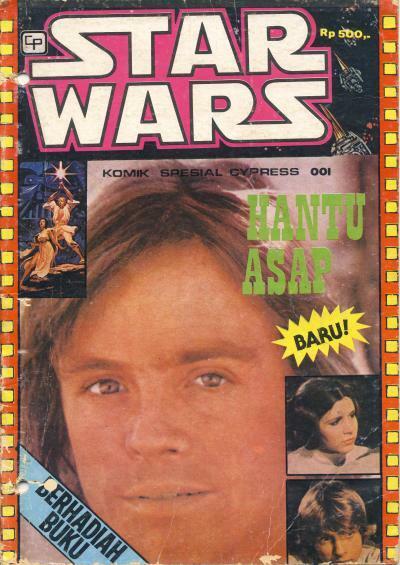 This Star Wars comic from Indonesia was published by Cypress in the early 1980s. 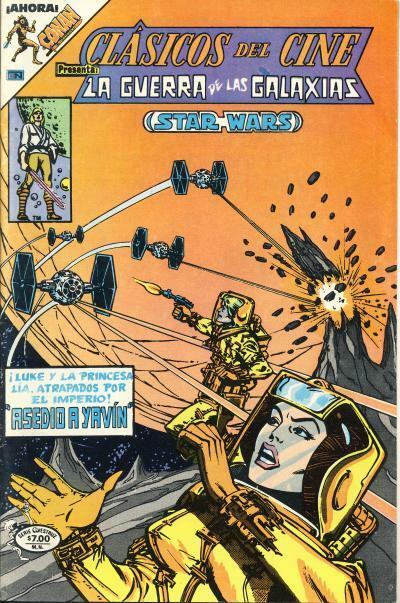 The title translates to Star Wars Special Comic Cypress #1. The cover is very busy. Front and center is a picture of a young Mark Hamill. This picture looks like it is covering art which has what looks like Carmine Infantino drawn Rebel Blockade Runners. Inline, in the lower right corner, are pictures of Luke Skywalker and Princess Leia from the scene in the movie where Leia is consoling Luke aboard the Millennium Falcon after the loss of Obi-Wan Kenobi. A blurb reads Baru! or New! below the title of the story, Hantu Asap or Smoke Ghost. The lower left hand corner has a banner that reads Berhadiah Buku or Lottery Books. The cover is a heavier stock than traditional comics and you can see where someone punched holes in the comic presumably to put it into some sort of binder. This full color comic is very thin with only 14 pages. 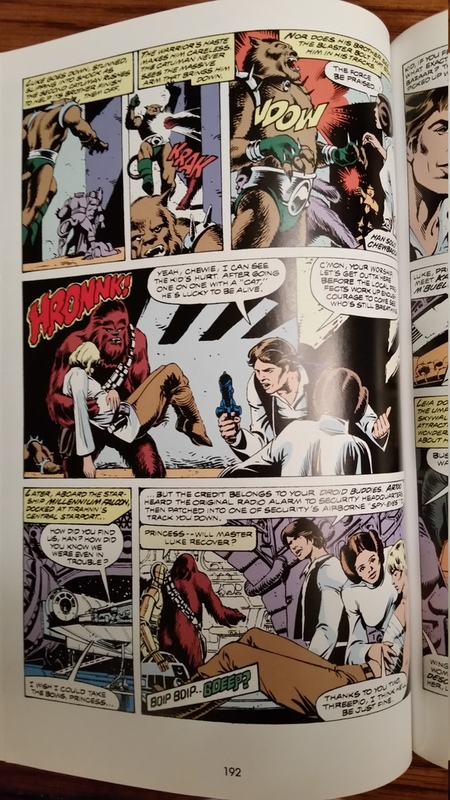 Most of the art on the pages are redrawn or traced from Star Wars Annual #1 whose story is titled The Long Hunt. As you can see on this page, much of the detail is missing in the background of the Indonesian panels. 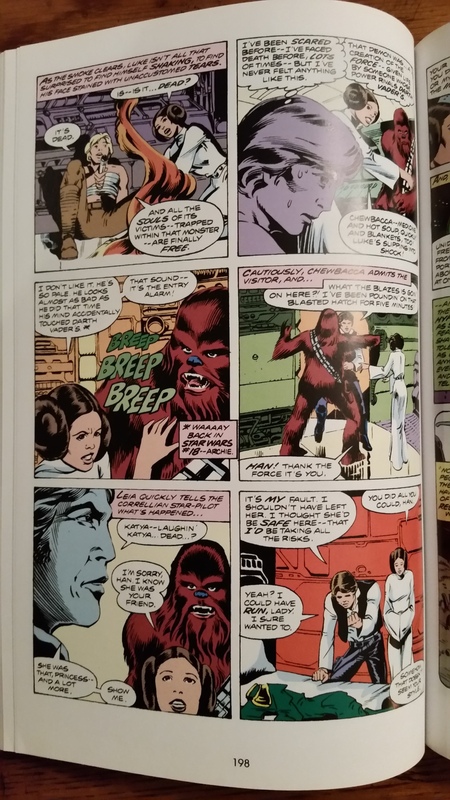 The bottom left panel has been replaced with a picture of Luke that looks like a Carmine Infantino drawing! 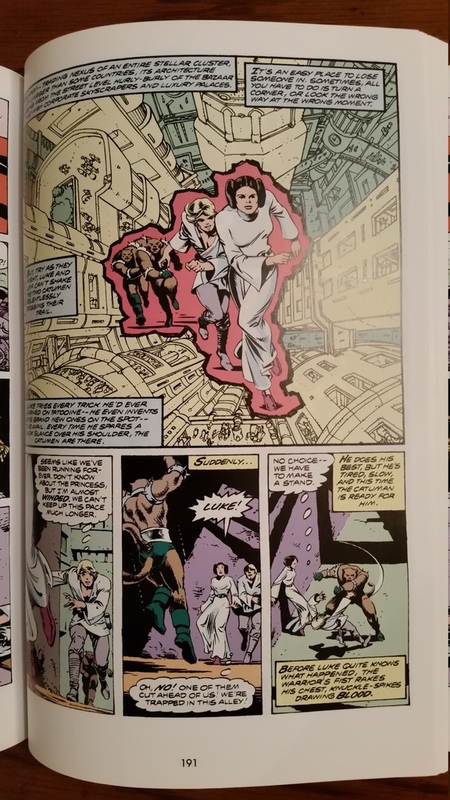 On this page, the picture of Luke and Leia running through the streets of Tirahnn are replace with art that looks like Luke and Leia swinging across the chasm on the Death Star. But instead of Luke holding onto the rope, he is clutching his lightsaber. This might be the only replaced panel that was not done by Infantino. 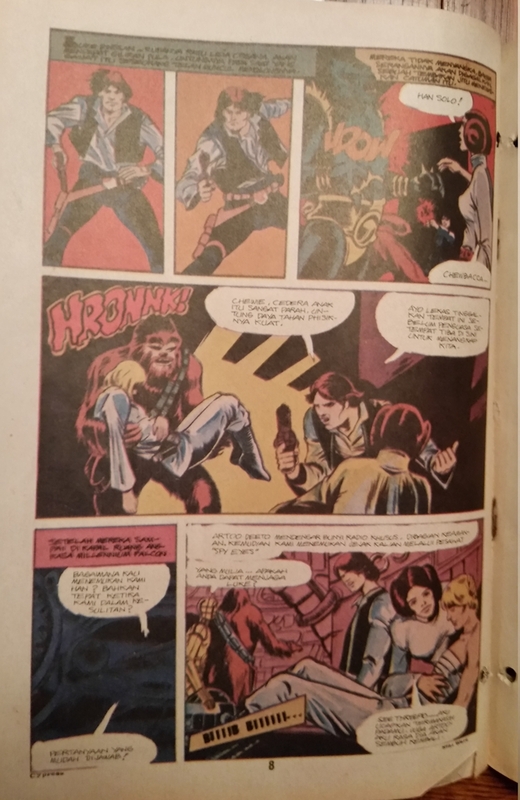 The next page shows Han Solo pulling his blaster from his holster like a western gun slinger. These two panels depicting this action are also drawn by Infantino. Han takes down the Catuman chasing Luke and Leia. 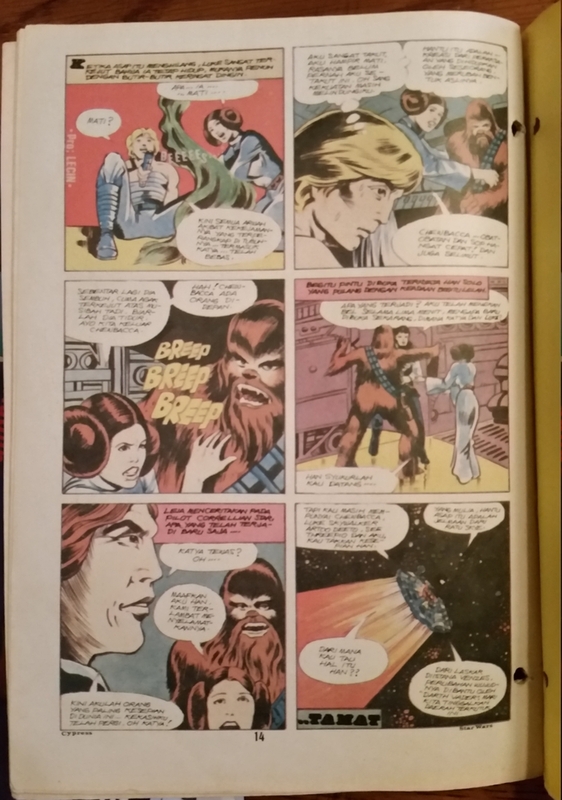 In Star Wars Annual #1, it is 2 Catuman chasing our heroes and Chewbacca stops one while Han blasts the other as shown in the third panel at the top. Notice in the first two panels Han is holding his gun in his right hand, but shoots with his left hand. Tricky! The final page in the Indonesian comic has different art in one panel but you can see Luke dispatched a green smoke creature with his lightsaber. In Star Wars Annual #1, the smoke creature is red. The final panel is another Infantino drawing, this time of the Millennium Falcon soaring through space. In the story from the annual, the final panel shows Han despairing over the death of Katya, a friend from his smuggling days. It looks to me like the replaced panels were used to not only simplify the story, but to simplify the amount of art that needed to be redrawn or traced. 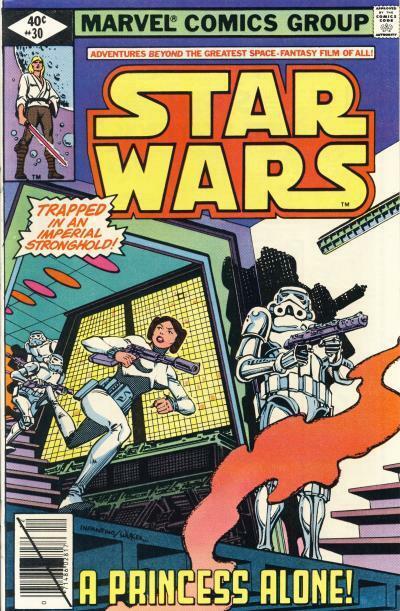 The art for Star Wars Annual #1 is by penciller Mike Vosburg and inker Steve Leialoha. Their art is very different from Carmine Infantino's art, who has a very distinct style by this point in his career, and these panels stand out. I'm positive all of the new panels are lifted from other Star Wars issues. Someday I'll have to translate this issue so I can see how the story differs from the annual. Well, I did get to see The Force Awakens on December 17th. I thought I'd revisit the 7 comics spotlighted and post what was learned. If you don't want to be spoiled, please do not proceed with reading this. Asajj Ventress did not appear in the movie and Lupita Nyong'o did indeed play Maz Kanata. We did get a Solo kid in the movie. Kylo Ren is Ben Solo. There is no chance Rey is Han and Leia's child. Is Ben Solo enough for this comic's price to remain high? So, we got a Ben Solo instead of a Ben Skywalker. It is also possible that Rey will end up being Luke Skywalker's daughter, although you have to wonder if that is the case why he could not have found a more hospitable planet in the Republic for her. The story about retrieving Darth Vader's lightsaber makes this one the most interesting comic on this list. Kylo Ren is not Darth Revan. In fact, Kylo is a member of the Knights of Ren and that group is the source of the surname he adopts. So, while this comic is interesting for the close visuals of Kylo Ren and Darth Revan, there is no other link between this comic and the movie. Chewbacca did not die in the movie. In fact, his character received much needed attention that he was not afforded in the original trilogy. The character who does die is Han Solo, killed by his son who has renounced his birth name. The reason for Luke Skywalker's absence from the movie has more to do with Ben Solo's crossover to the Dark Side than Luke's fall. We do know that Leia and Han know about Supreme Leader Snoke. The visuals for the character in the movie are nothing like Darth Plagueis in the Expanded Universe, but that does not necessarily discount Snoke being Darth Plagueis since the Expanded Universe is no longer considered canon. Unfortunately, we will not know until a future movie if this rumor turns out to be true or not. "What good is all your uncle’s work if its taken over by the Empire? You know they’re starting to nationalize commerce in the central systems. It won’t be long before your uncle is merely a tenant, slaving for the greater glory of the Empire." I like to think these lines, from a deleted scene between Luke and Biggs Darklighter on Tatooine, were the inspiration behind the story in Star Wars #30. In this issue, we see what it really means to be "slaving for the greater glory of the Empire." The story, titled A Princess Alone!, starts with Princess Leia being delivered to Metalorn aboard a cargo freighter. Coincidentally, at the same time, we learn that Baron Tagge is also visiting the planet, to check on an automated weapon detection system installed by one of the many Tagge family businesses. Metalorn is one of a hundred Imperial Factory planets and the labor force works below the harsh, inhospitable surface. The Imperials, led by Governor Corwyth, run an extremely regimented society; workers are told when to work, eat, and sleep. Children also exist in this environment and free time is earned by the workers. The environment is reminiscent of George Orwell's dystopian future in the book 1984 including their strict control over the "news". It is mentioned in the story that there are agri-planets (agriculture planets) that undoubtedly are operated with the same efficiency the Imperial tyrants use on the factory planets. Most of this information is conveyed in a sequence where a little girl, named Tammi, is planting seeds in a pile of dirt in this predominately metallic stronghold. As the girl's mom races to her side, an Imperial Stormtrooper threatens to report the incident if the mom does not return to her work detail and the girl to her instruction unit. The story is simplistic but effective in conveying the Empire's over reliance on technology as Leia is able to evade detection as she seeks out a former teacher, Professor Horada, in a food concourse. Baron Tagge, unlike his Imperial colleague Corwyth, clearly understands the limits of technology and is able to ascertain it is Leia who has infiltrated the society. Baron Tagge confronts Leia just as she is telling her old professor the truth about Alderaan. Leia escapes with the help of Tammi. As Leia departs Metalorn, again aboard the cargo ship, she tells the captain her mission was a success because she has helped sow the seeds of rebellion. Poetically, the story ends with Tammi sneaking away from her instruction unit to plant more seeds in the dirt. On many of the Star Wars planets we've encountered in the movies, animated series, books, and comics, most citizens of the Empire lead a normal life, free from the atrocities committed by their tyrannical overlords. It is easy to forget why there is a rebellion, because on the surface, the Imperial presence on most planets seems more like benevolent law enforcement than military dictatorship. It is stories like the one found in Star Wars #30 that drives home the reason and need for a Rebellion against the Galactic Empire. @whoareyoutocare I'm told it ends with 12. But #StarWarsKanan 9 is available tomorrow! As is #StarbrandandNightmask #1! Kanan has been the lowest selling ongoing Star Wars title from Marvel. 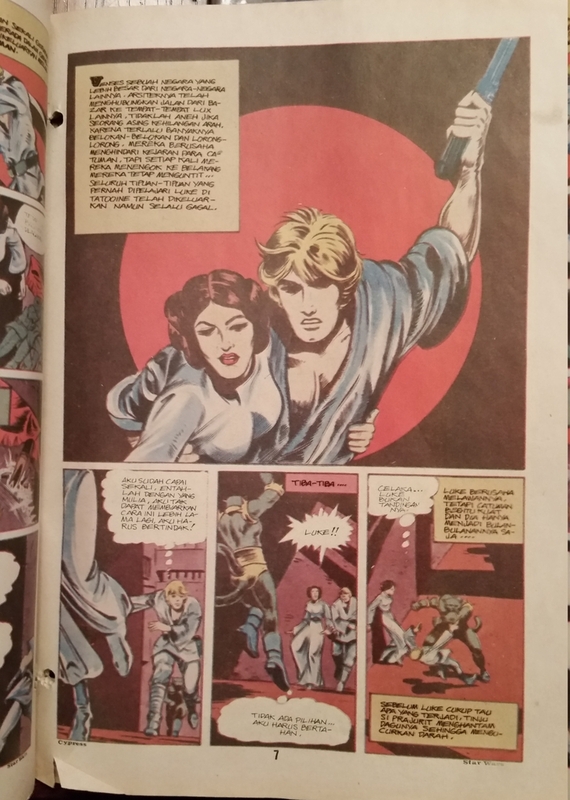 John Jackson Miller over at The Comics Chronicles posted an interesting blog spotlighting Marvel's original Star Wars title. In the posting, he has a link to the circulation numbers that he gathered for the title along with other interesting tidbits. I'm always amazed at the low sell through comics use to have. Nearly half of all the Star Wars issues printed were returned to the publisher. Please read the blog posting A long time ago: Original Star Wars comics title's sales history, 1977-1986. With The Force Awakens set to open in theaters across the world next week, I thought it would be fun to gather all the movie rumors that have impacted Star Wars comic sales over the past year. Additionally, I've throw in a few ideas of my own. A word of caution, while I have not seen the movie nor do I have any inside information concerning the movie, much of this can be construed as spoiler material. If you don't want to be spoiled, please do not proceed with reading this. There was an early rumor that Lupita Nyong'o was going to play Asajj Ventress in The Force Awakens. This rumor is looking unlikely as Lupita's character is now said to be the pirate Maz Kanata. 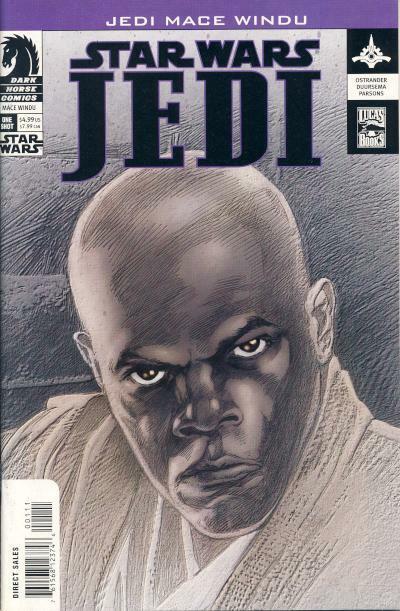 Asajj Ventress' first comic book appearance is in Star Wars: Jedi - Mace Windu. The rumor of Jacen and Jaina Solo appearing in The Force Awakens is one of the earliest rumors when the movie was announced. These twins are offspring of Princess Leia and Han Solo in the Expanded Universe and they made their comic debut, as babies, in Dark Empire II #5. There are those who believe Rey, played by Daisy Ridley, and Kylo Ren are brother and sister. Rey's line "I'm nobody" could be her trying to throw someone off on her lineage. Another rumor is the offspring of Luke Skywalker will appear in the movie. I have seen some rumors that say it is Rey and others say it is Kylo Ren. I will say this, I think it is more likely that one or both of these characters are directly related to Luke than to Leia and Han. One of the mysteries about the new movie is Luke's absence, so it makes far more sense for Luke to have abandoned his children than for Leia and Han to do so. Star War Tales #19 contains a tale titled The Lost Lightsaber, about Luke's son, Ben Skywalker, retrieving Darth Vader's lightsaber from a group of Dark Jedi. The story itself is an interesting parallel to the rumored story of The Force Awakens. Star Wars Tales #23 contains the first comic book appearance of Darth Revan, a character that looks similar to Kylo Ren. There are some who speculate that the name Kylo Ren is a ruse and the character in the movie played by Adam Driver is really Darth Revan. We have all seen the trailers for The Force Awakens. Some viewers studied the trailers and believe Daisy Ridley's character Rey is crying over the fallen bodies of Han Solo and Chewbacca. It would be an interesting twist for Chewbacca to be brought back from his death in the Expanded Universe book Star Wars: The New Jedi Order - Vector Prime only to be killed off in this new movie. If that is the case, Dark Horse commemorated our favorite Wookiee's life in a Chewbacca mini-series just after his death the first time around. Luke's absence from the trailers has many fans speculating where the last Jedi might be. Some are speculating Luke has crossed over to the Dark Side of the Force. In Dark Empire #3, Luke Skywalker flirts with the Dark Side when he joins the resurrected Emperor Palpantine. Chancellor Palpatine: I thought not. It's not a story the Jedi would tell you. It's a Sith legend. Darth Plagueis was a Dark Lord of the Sith, so powerful and so wise. He could use the Force to influence the midi-chlorians to create... life. He had such a knowledge of the Dark Side that he could even keep the ones he cared about... from dying. Anakin Skywalker: He could actually... save people from death? Chancellor Palpatine: He became so powerful, the only thing he was afraid of was... losing his power which, eventually of course, he did. Unfortunately, he taught his apprentice everything he knew. And then his apprentice killed him in his sleep. Ironic. He could save others from death... but not himself. The latest rumor says Andy Serkis' character Snoke is really Darth Plagueis. When you look at foreign comic covers that are based on U.S. covers, there are usually small differences. The obvious differences are the title and text being translated into the foreign language. Sometimes this requires the movement of text boxes or word balloons to accommodate the translation. Another obvious difference is the dressing. Dressing can include: the price, cover date, publisher, and issue number. Less obvious can be color differences. These can usually be spotted by a side-by-side comparison of the foreign and U.S. comic. Another subtle difference can be how the cover art is reduced and trimmed. Sometimes a foreign cover is reduced and trimmed so less of the original image is retained, but sometimes it can be trimmed so even more of the art is seen. Many times, this is dictated by the dimensions of the foreign edition, which don't always match the dimensions of a U.S. comic. The Krieg der Sterne title by German publisher Egmont Ehapa was published in a large, magazine-sized format. The aspect ratio of the format dictates a wider image than a U.S. comic. For this reason, extra trimming is done on the top and/or the bottom of the cover image. On the other hand, Editorial Novaro used dimensions slightly smaller the U.S. comics but retains a similar aspect ratio with their avestruz format. For the Clásicos del Cine issues that are published in the avestruz format, they reduced the image more to retain more of the image lost in the bleed on the U.S. covers. 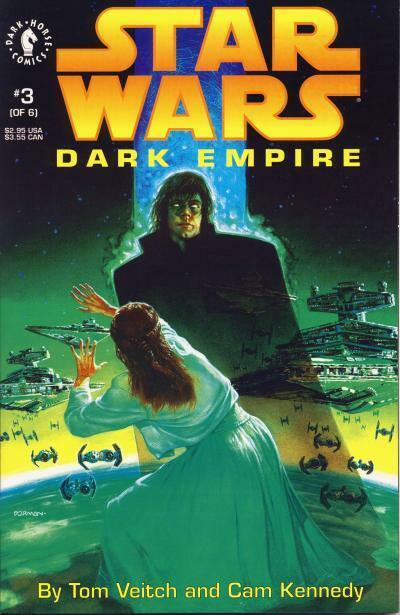 It is for this reason, I'm a huge fan of Editorial Novaro's Star Wars issues; you get to see more of the art than is shown on the U.S. cover even accounting for the standard deviations found in the trimming process. On the cover for Star Wars #25, you can see three TIE Fighters in front of the gas giant Yavin. 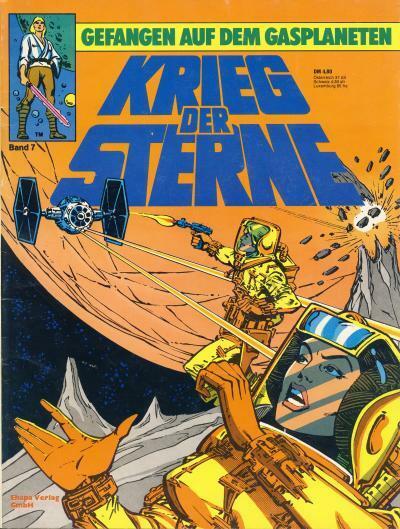 The cover to Krieg der Sterne #7 contains the same cover with less of Yavin shown since the publisher chose to trim the top of the image. To accommodate the title moving down on the image, two of the three TIE Fighters are removed. Luke Skywalker's blaster fire is extended and curves down slightly, giving the appearance that Luke is shooting directly at the TIE instead of over it. On the cover to Clásicos del Cine #312 are four TIE Fighters. More of the outcrop behind Luke is shown and we can see the back of Princess Leia's helmet, which is cut off in the U.S. edition. I'm guessing the original artwork has four TIE Fighters. Another interesting point about the two foreign covers shown above; the cover artists, Carmine Infantino and Bob Wiacek, had their signatures removed from the image.